Add any fruit you have on hand to this delicious salsa - blueberries are delicious added in. The cinnamon chips are yummy! Dovetailing Tip: Fruit is in season, so take advantage. Save some strawberries to use in the salad for Meal 3. In a large bowl, thoroughly mix kiwis, apples, raspberries, strawberries, and fruit preserves. Cover and chill in the refrigerator at least 15 minutes. Brush melted butter on one side of each flour tortilla. Cut into wedges and arrange in a single layer on a large baking sheet. 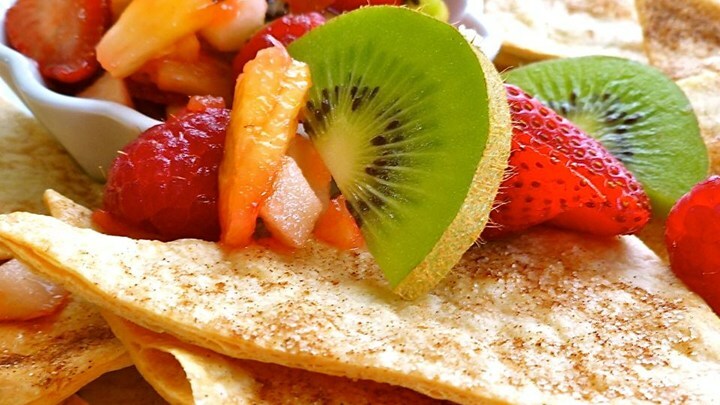 Sprinkle wedges with desired amount of cinnamon sugar. Spray again with cooking spray. The Best Garlic Bread You’ve Ever Had! This Lemon Cream Cheese Pie Will Knock Your Socks Right Off!